There is nothing so sweet as tiny baby feet but sometimes those precious piggies need covering with itty-bitty socks. 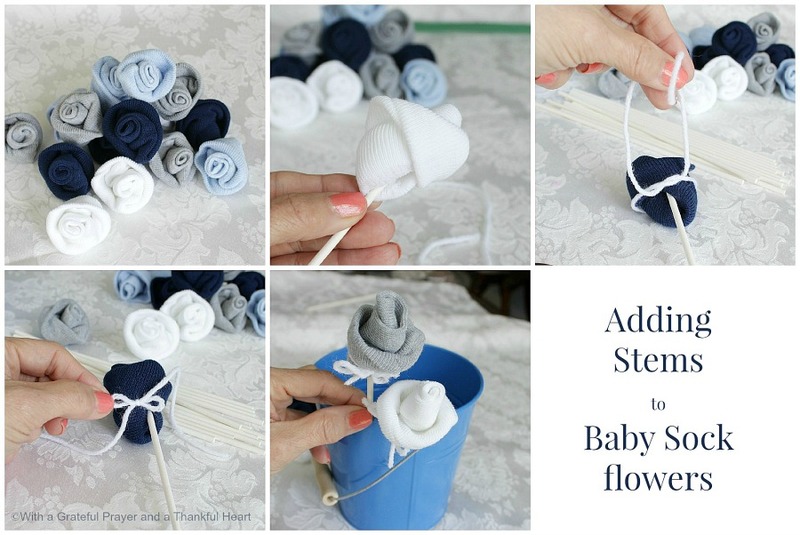 Make this pretty Baby Socks Rose Bud Flower Bouquet arrangement for a lovely and useful shower gift or centerpiece. There are affiliate links in this post. 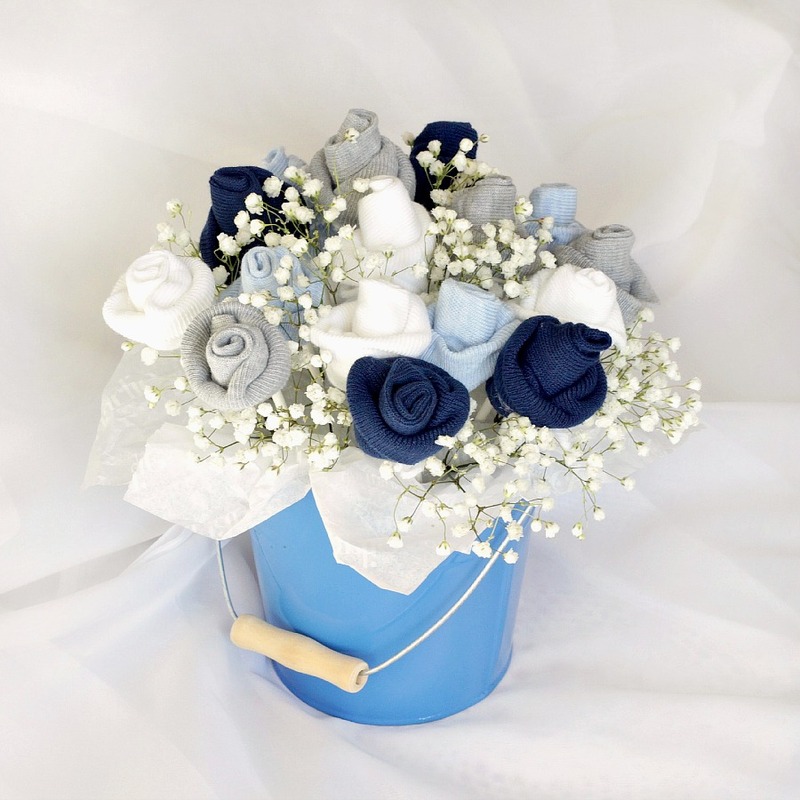 This Baby Sock Rose Bud Flower Bouquet was featured in Country Living Magazine. 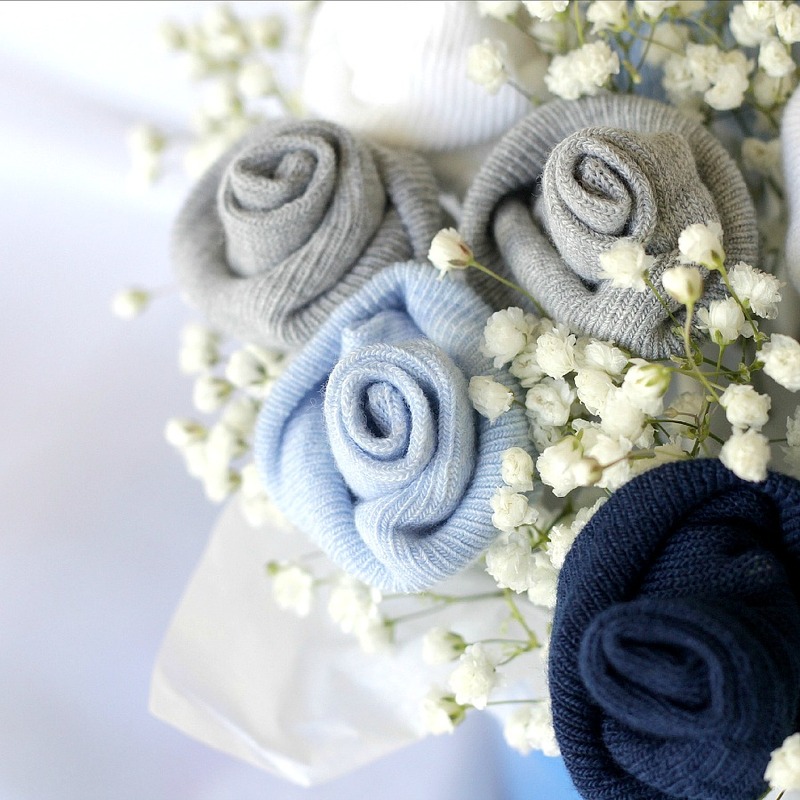 A bouquet of baby sock roses is a cute way to present them to an expecting mom. A few rolls and a simple twist and before you know it you will have made a pile of rose buds. Use them to create a corsage, a gift topper or fill a small bucket or flower pot with a bouquet. I used 8 pair of infant socks to make 16 roses for the baby socks rose bud flower bouquet. 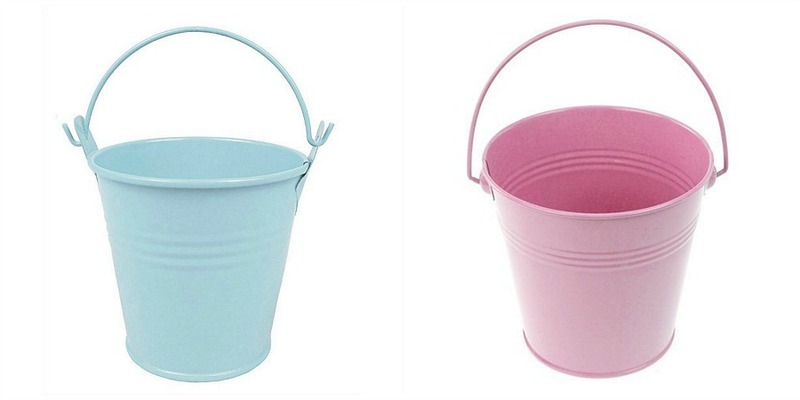 Currently Amazon has cute light blue 5-inch metal buckets and light pink 5-inch metal buckets. Click banner below for 30-day free trial prime. Beginning at the toe edge, softly roll to the top of the sock. The roll doesn’t need to be tight. Take the top edge (on the heel side or bottom of the roll as you view the center photo above) and turn it over onto the roll. Fiddle a little until you have your desired flower shape. You can gently pull the center to form a longer center or smooch it a little for a flatter blossom. Turning the sock rose over, nudge the stick in, being careful not to push upward too far. 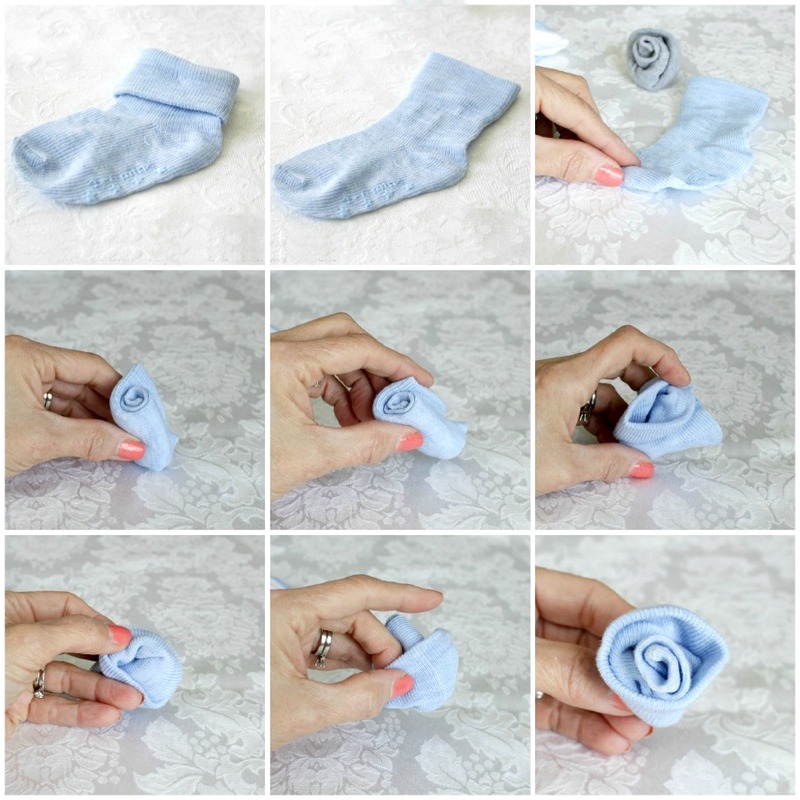 I found the stemmed sock roses just secure enough to tuck onto the floral foam without tying. The addition of baby’s breath kept everything snug. If you would like to make the arrangement more secure, it would be best to use a length of yarn tied tightly around the sock and stick. Take a 10-inch piece of yarn and tie a small bow; trim if desired. Your could use thin ribbon in matching or a contrasting color. I like the yarn because its slight stretchy-ness helps keep the bow tight. Floral tape is another option but I did not want to use it on the socks and I did not want the green showing. Fill your container with floral foam cut to fit. I used a piece of tissue paper to cover the foam but Easter grass would work too. Using a skewer to make a pilot hole in the foam, insert each sock rose. Tuck in silk leaves, flowers or baby’s breath to fill in any gaps. 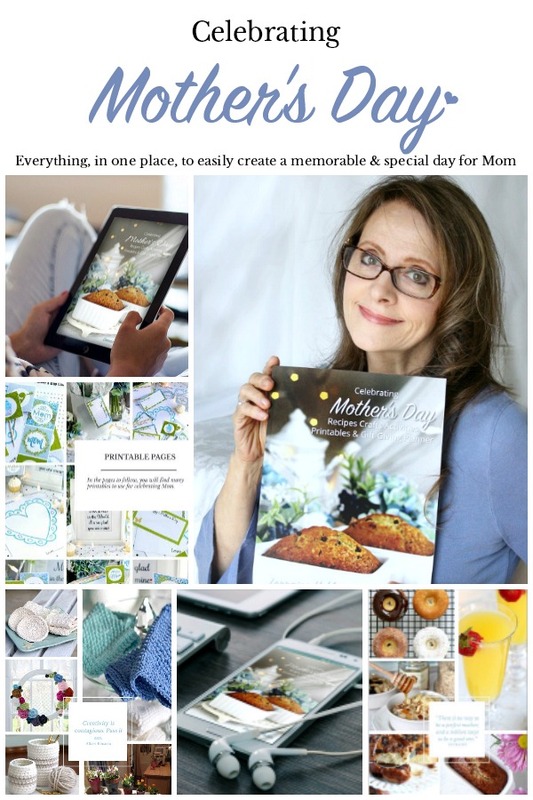 If you like to cook, bake and entertain as much as I do, I think you will like this easy guide for Celebrating Mother’s Day. If you enjoyed this post, you’ll love my email. Subscribe to have updates delivered to your inbox (about every three weeks) and receive FREE gifts available exclusively for subscribers. 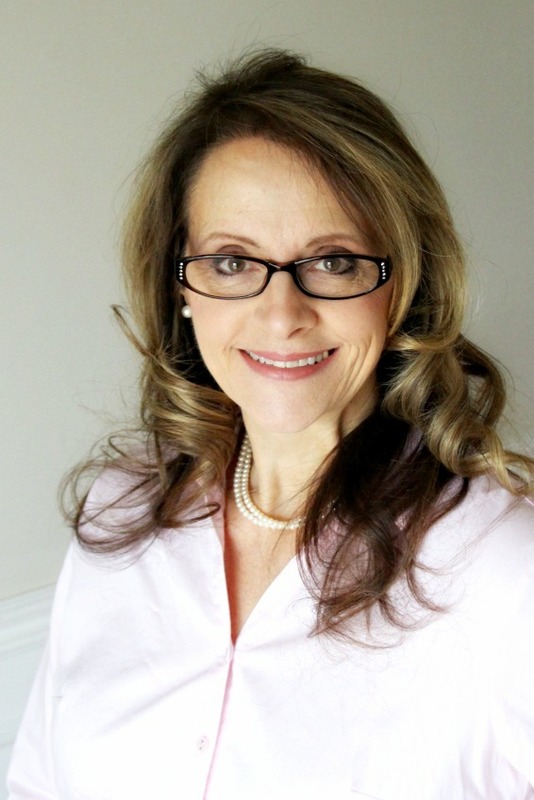 Don’t miss new content with recipes and ideas to inspire & encourage you. We would love for you to join our community. Just click the subscribe button below. I loved this idea and made a similar arrangement for my boss’ baby shower his wife is having a little girl soon. They loved the gift from the heart. 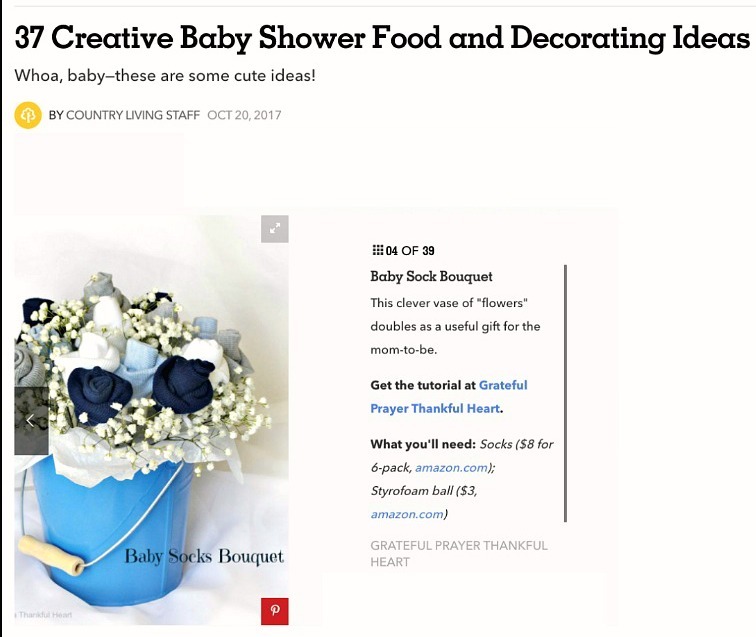 Can you use baby mittens in the bouquet? I have only made the rosebuds using baby socks. I took a look online at baby cloth mittens and though they look a little thinner than the socks, I think they might work. The rosebuds might be a little smaller so you might add more to fill the bouquet. Thank you for stopping by and leaving your comment! So adorable! Where did you get the bucket that’s in the picture? It doesn’t seem to be the same bucket as suggested in supplies section. 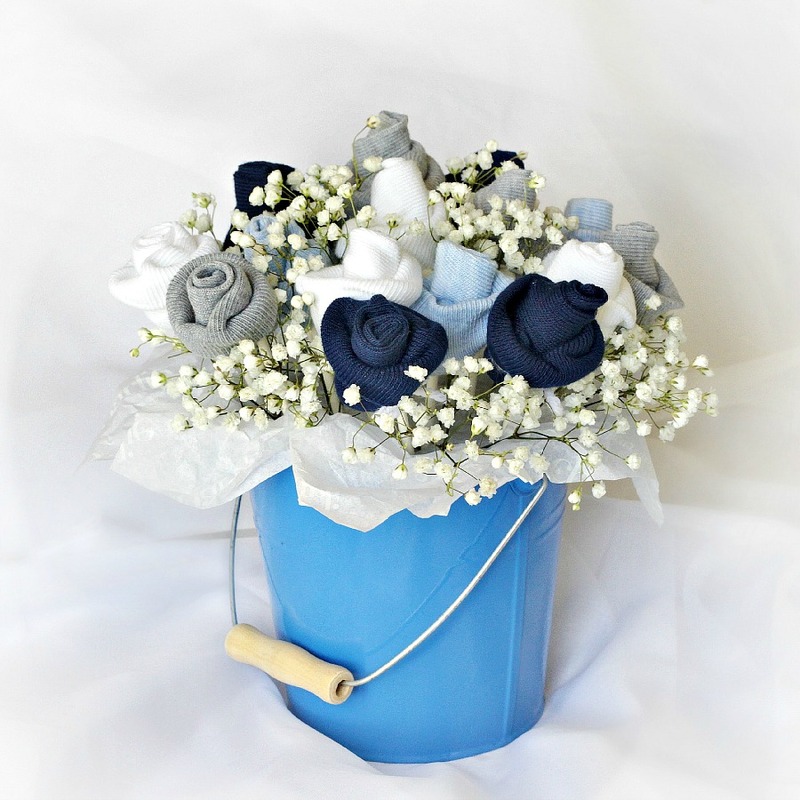 The bucket I used in the finished bouquet is no longer available. I have searched and searched but cannot fine one exactly like it. The buckets listed and available on Amazon are similar in size and style. Hope this is helpful to you should you decide to make the project. So cute and clever! Congratulations for being featured in Country Living! This bouquet is beautiful! I would like to make one. If you remember…what size bucket, length of pop sticks, and measure of floral foam did you use? Pinned ya! I have a girlfriend who is expecting. This will be a great gift for her. Please come share at the Anything Goes linky, it just started over today. 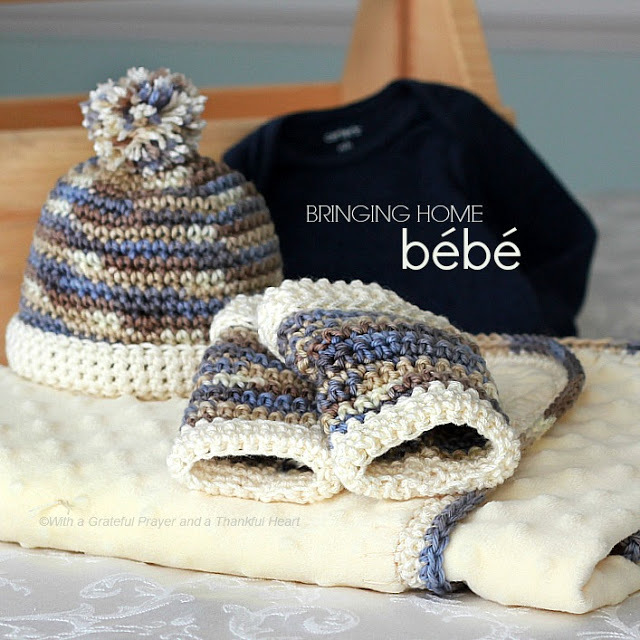 So sweet, and just perfect for a baby gift! Thanks for sharing at Fridays Unfolded! Thank you for sharing at the link-a-long on the Go Crochet Crazy blog! Hope to see you again next week at http://www.GoCrochetCrazy.blogspot.com ! Oh Lorraine this is completely adorable and perfect timing as I will soon be attending a baby shower. Thank you for sharing. Aww, now that is just precious!!! This is such a fantastic idea! I've never seen anything like this before. Such socks bouquet can make an inexpensive, but so beautiful and useful present. Thank you Lorraine for sharing it! You did it again! You did another over-the-top creation and I am in awe of the finished product! So cute! So thoughtful that someone would take the time to make a bouquet like that. In my opinion, it is better than a bouquet of flowers. Your new blog header is beautiful and seems like the perfect way to be greeted by you, in this blog! What a darling idea. It would even work for part of a shower's decorations. What a brilliant beautiful idea!! For my first born my husbands cousins made me a three tier cake out of diapers, decorated with all useful baby accessories – nail clipper, thermometer etc.